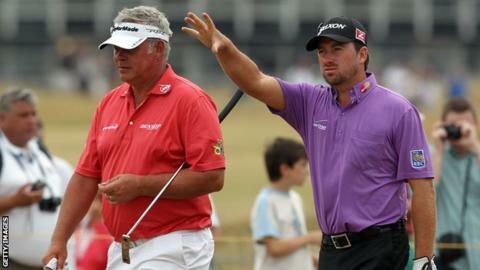 Graeme McDowell says winning this year's Irish Open at Portstewart would fulfil one of his golfing dreams. The 2010 US Open champion has watched his compatriots Padraig Harrington, Shane Lowry and Rory McIlroy win the Irish Open over the last 10 years. McDowell, 37, will hope to join the list of home winners in early July while Darren Clarke is also hoping to break his Irish Open duck. "Winning the Irish Open is something I've always dreamed of," said McDowell. "The Dubai Duty Free Irish Open is always a special week for me but this year it will be even more so, returning once again to the area where I grew up. "Portstewart is a fantastic golf course and it's great to be going back to another classic links. "The atmosphere is always something else when the Irish Open comes to Northern Ireland and I'm sure this year will be no different." This year's event will be third event of the European Tour's new Roles Series - a premium category of events each with a minimum prize fund of $7m. McDowell grew up in nearby Portrush while Clarke, the 2011 Open Champion, now lives there. Clarke, 48, says he is "always so proud" when the Irish Open comes to Northern Ireland as it did in 2012 at Royal Portrush and three years later at Royal County Down, when McIlroy's charity, the Rory Foundation, began to host the event. The Portrush event was the first time the tournament has been held in Northern Ireland since the 1953 event at Belvoir Park. "Portstewart is a spectacular links golf course and with this year's event being a part of the Rolex Series, with a new date on the calendar and boasting an increased prize fund, I'm sure we'll attract another great field," added Europe's 2016 Ryder Cup captain. The Irish Open will begin three weeks of links golf in Europe, being followed by the Scottish Open at Dundonald Links and The Open at Royal Birkdale. The club is just four miles from Royal Portrush, which will host the 2019 Open Championship. Four-time major winner McIlroy donated his prize money from his K Club triumph last year to his foundation, which supports a number of children's causes. BBC iWonder - What makes the perfect golf swing? Read more on BBC iWonder - What makes the perfect golf swing?